The Moderno Ebony Marble Cremation Urn is made from cultured marble. The urn is accented with swirled colors and a polished finish. Cultured marble is a very durable yet attractive material, making it perfect for internment or display. This urn can be directly engraved, or an engraving plaque can be added by following the 'personalized engraving' link below. The simple yet modern design of this urn will bring peace and calm into your heart. "Upon the death of my brother, I was not asked what his final resting place would be nor was I informed the container I suggested was not the right size. I was then in search of a correctly sized urn suitable for a burial at sea. As my experience with a sales person was less than satisfactory, I went to the internet. 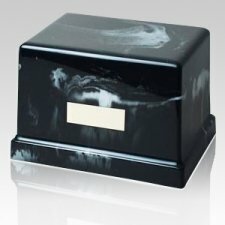 After looking at many sites, I chose memorials.com for their selection, pricing and clear information. As a precaution, I called customer service to ensure I was getting the right product for my needs. The service was exemplary. My questions were thoroughly researched and competently answered. My urn arrived carefully packed and exactly as described. I am well pleased with my purchase and will come to this site immediately when I need another urn."